Celeriac is a wonderful veg and alternative to potato, and thankfully these days its readily available. It also makes for a wonderful velouté or soup. In this instance, I have roasted it with parsnips before adding both vegetables to chicken stock and blitzing them to form a thick and velvety smooth soup. (If I had added cream, it would have become a velouté). Served with a sprinkle of salt, pepper and olive oil it is a lovely thing. 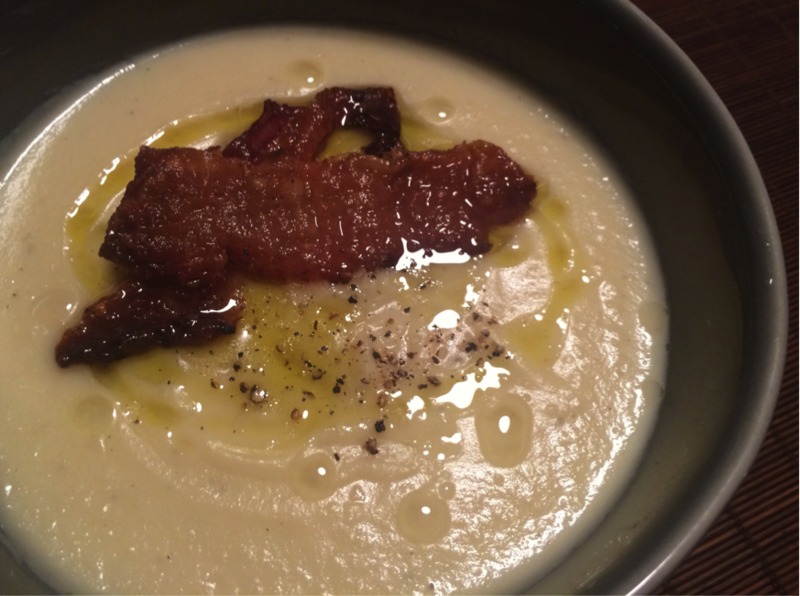 The robustness of the soup means you can also garnish with other flavours such as an addition of truffle oil or crispy pancetta. While I’m yet to test them, I have a feeling that julienned apple or sautéed wild mushrooms, such as horn of plenty or sliced ceps, would work well as a garnish and, in each case, white truffle oil could also be used. Heat the oven to 200° Peel the celeriac, parsnips, potato and onion. Then cube the celeriac, parsnips and potato into 1.5cm cubes. Halve the onion and then slice it at 1cm intervals. Lay the chopped and diced veg out on a large roasting tray, add the thyme and garlic and sprinkle over salt, pepper and a good glug of olive oil. Toss all the ingredients in the oil and seasoning and then place in the oven to cook for 20-30 minutes or until the veg is soft. Once the veg is cooked, remove it from the oven and set aside while you bring the stock to the boil. Once the stock is warm, but before it has reached boiling point, add the veg to it. As soon as the stock is boiling, turn off the heat and allow it to cool. Once cooled use a blending wand to blend the stock and veg to a puree; the longer you do this the smoother the soup will be. Alternatively, you can do this in batches with a blender. To serve the soup reheat it on the hob, divide among bowls and top with your choice of garnish.